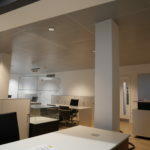 We are an experienced ceiling contractor, hold relevant insurances, keep up to date with our training and are ConstructionLine Gold accredited. We work both for other contractors, as we as directly for end users. 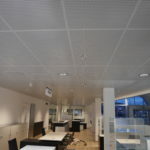 Metal suspended ceilings are generally installed due to their robustness, or due to their architectural design. They are formed by installing a supporting system, similar to a grid or mf ceiling, which numerous different options for installing the tiles; from clip in tiles, to those that hang. 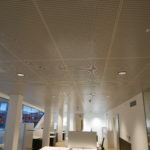 A security metal ceiling system is available for high security areas. 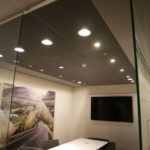 Predominantly the metal ceiling industry is dominated by Armstrong, SAS and Burgess; although other international manufacturers sell into the UK market, including Durlum.